At E3 this year, we got a chance to demo the upcoming update for Cube Creator 3D, and really liked what we saw. Among other things, Cube Creator 1.2 will be adding in local multiplayer and texture packs, which should expand on the core experience nicely. No timeframe had been given previously as to when the update could be expected, and Big John Games recently put out a statement explaining the reason behind the protracted development period. There has been a slight delay in development of Cube 1.2. We are a family business. As such, we have had an unexpected tragedy in our family and that has required much of our time to be devoted to mourning, grieving and dealing with many family matters. I would also like to let everyone know we are down to last our last 50 bugs. We are working hard to eliminate these as fast as possible. We are back to 100 percent and are knocking off these bugs as quickly as we can. What do you think? Are you looking forward to the new update? 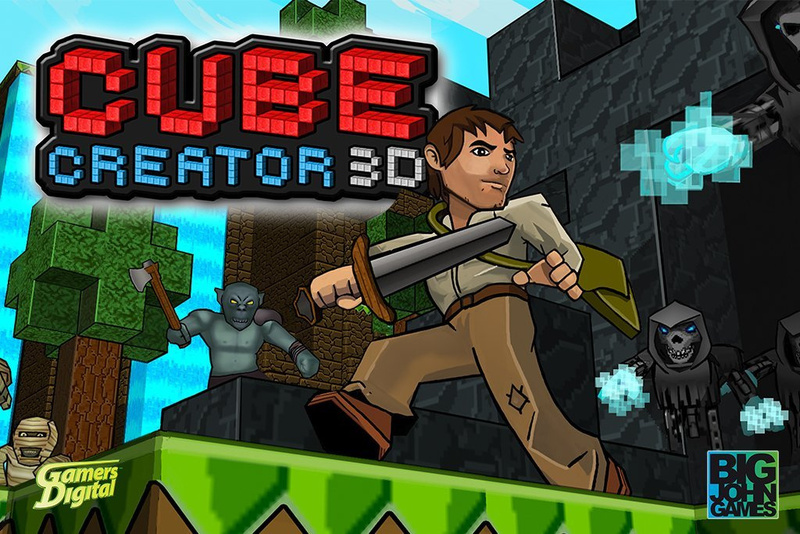 How have you enjoyed Cube Creator 3D? Drop us a comment in the section below. I couldn't care less about whatever game they're making (I'll stick to Minecraft: Wii U Edition), but I hope everything's okay with them. I had forgotten about it hah. Sorry to hear they're going through rough times. This game is certainly the best block building game available for the 3ds. I'd recommend it to anyone who wants something like that on their system. It's pretty fun if you can forget about the sickening framerate. It only gets worse in 3D, but that's not required. If you really want mobile block building I'd just recommend using a smartphone and compatible controller with a stand for your phone with Minecraft: Pocket Edition. Nice to know they haven't forgotten about this/died though, I will check it out again when the update is released. Aww man... Will be praying for them. Good luck to 'Bigjohngames' I've spent many hours and days with this software. @Meowpheel I honestly enjoyed Battleminer more. It feels like a more spacious environment to build in. @AfterAnAutopsy the problem with Wobbly Tooth's entries is more in style. This one has bright colorful graphics reminiscent of Minecraft, while Battleminer has dull environments and colors. The Magic Hammer is the cheapest one, and it would be close to being the best one, but the limited color palette in creative and the annoying presence of the hammer blocking a third of the screen keep it down. Sorry to hear about your tragedy. Hope all gets better soon. Gaming can always wait. It's sad news. Good to hear they're back on their feet, though! I always wished I'd picked up Cube Creator 3D in stead of Battleminer, but BM got there first and I just wanted something Minecrafty on the 3DS. Somebody actually...enjoyed Battleminer? Each to their own! 'Follow compass, take out ants, save person' repeat 20 times, game over. @Meowpheel Cube Creator just feels too small when compared to Battleminer. The Magic Hammer wasn't very good in my opinion. It lacked a way to motivate players to keep playing. @AfterAnAutopsy it's really just big enough for what most people would need. Again, it's more about the style. Cube creator simply looks better in motion. @Meowpheel i mean if we're comparing it to Minecraft it's incredibly limiting whereas with Battleminer I've never seen the edge of the map. In motion it may look better, but when you hit the edge of the map after a few minutes what good is it? @AfterAnAutopsy keep in mind I'm not comparing their "adventure" modes. They're all terrible. I'm talking about the creative aspect. The available space you're given in cube creator is large enough for basically anything. Having an endless landscape of nothing is not useful in this regard. @Meowpheel I mean I spent 80 hours building a world of my own in Battleminer, whereas in CC I looked at some trees and building just wasn't as intuitive. My kids friend bought this in anticipation of multiplayer so they could play together. I thought I had read that it was going to be out by the end of summer and I was wondering about it recently. I'm sorry to hear about the loss. I appreciate the update on the progress though and given the circumstances dont mind waiting for the release. I was a little worried since I was the one who told him they would be able to play together. They both enjoy the game and his friend only has the 3ds so I'm glad someone made a decent Minecraft type game for a reasonable price. @AfterAnAutopsy of the three similar games available, my favorite "adventure mode" is probably the one from The Magic Hammer. It was repetitive and all, but I enjoyed it the story a bit... Also I like how the different biomes combine and you unlock a top down view mode after beating the story. This one probably has the worst, mostly because there's nothing to do. I don't even really consider The Magic Hammer to be in the same vein as Battleminer or CC though. It's an adventure game with building options whereas the other two are building games with some adventure parts. At least that's how it felt to me. It's definitely the weakest of the three though.